You’ll probably ask immediately: good enough for what? Well…that’s exactly the question to ask when it comes to your photography workflow. While my last article deals with similar basic questions, this article is a variation on the same theme but with a twist. I hope you like the twist. Let me add to the question then, so that my intention becomes clearer. Is your photography workflow good enough for YOU ? Ok, ok…I’m still evading the actual question. Well, here it is: Is your photography workflow good enough for YOUR PURPOSES ? This question looks just like the questions from my previous article, so I gotta be running out of ideas for my blog…hmmm…I hope not. Well, as always, you’re the judge. So, read on…I’m hoping that my point will become clear. The blanks are…the most important part. All photographers have a workflow (yeah, yeah…I’ve said it many times), weather it’s simple or complex, everyone with a camera has a workflow to get their pictures from their cameras to…what ? Don’t be too quick to fill in the blanks, because the blanks are the point of this article. The end of your pictures, the purposes behind you taking the pictures are the most important part of your workflow. Some (maybe many) photographers make immediate changes to their workflows as soon as they read something new that someone else is doing. If it looks cool, I’ll do it too! It doesn’t really matter if it helps me or not…as long as it’s cool and…of course, high tech! It really sounds like I’m mocking someone…but I’m talking about myself, because that’s how I use to think for some time. An extreme example is worth…about 2000 words. Let me use an extreme example so that my point is clear. For most of us one of the most important purposes for our pictures is to capture the lives of our families in pictures and to share those moments with friends and extended family. E-mail, Flickr, Shutterfly would be some of the means by which we want to distribute these “frozen” moments of our families. Here’s the extreme part…I’m sure no sane photographer does this, but it’s good for illustration’s sake. Now, if I start going mad applying tags to all my images and all I put in my tags is the exposure time and aperture values then I’m essentially wasting time and not doing anything that would help me achieve one of the most important purposes for my pictures. Why? Because my mad tagging will not help me search through my pictures to find the ones my intended users would be interested in. Most of my friends and family could care less about exposure time and aperture value as long as they see my family in the picture. On the other hand, if I use tagging with a little more sense, and create tags based on names of my family members as well as names of places, then this action will most definitely support my most important purpose. Why? Because I can easily find the pictures my intended users would like to see…like pictures of my daughter, or pictures from some event we attended. So, as it is obvious by now, you can have steps in your workflow that don’t support your purposes, just like you can have steps that would support what you’re trying to achieve with your pictures. Say it again please ! So, is your photography workflow good enough for YOU? 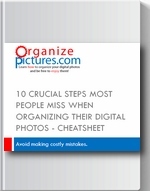 Do you find your pictures quickly, can you easily reformat your pictures for your indended “user”? Well try to analyze yoru workflow and find how do you most often use your picture collection and organize your workflow around that. This way you can find out if your workflow helps you or it is just a complicate maze of wires, cameras, computers and DVDs that nobody can sort out…not even you. This looks like a great site. I have a question for you. I use Adobe Photoshop Album to organize my pictures. Recently, I moved all of them to an external hard drive to free up space on my C drive. It turned out to be a nightmare, when I tried to retrieve some of them to edit, as Photshop Album could not always match up with the files on the external drive. It said it could not connect to the original photo. I ended up moving them back and not my hard dirve is full again because of the 1000’s photos back on the system I know I need a larger hard drive, but will have to wait a little longer to buy one. Any ideas. Can Adobe PA be installed on external drive to prevent this from happening? Donne…unfortunately I don’t use Adobe Photoshop Album, but from what you’re describing it is probably a database driven software. This means that when you browse through your pictures using the software, you’re actually finding the pictures using some sort of pointers your software creates. This is common for database driven photo management software programs. When you move the pictures without using the software itself, then those pointers it has created are pointing to “nowhere” and you can’t find your pictures. The solution…you have to see if you can move those pictures using the software itself and not outside the software. It has to know that you have moved them to an external drive. Hope this helps. I’ll see if I find time to look it up online for you.